This van driven Robert Domagala drove off the road and struck two power poles at 3511 Ridge Road/Route 104, just past Church Road, earlier this morning. 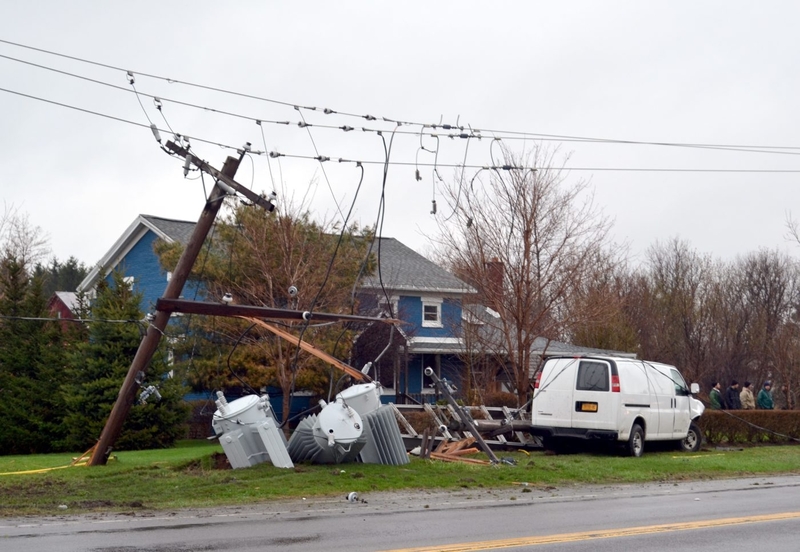 CAMBRIA – Hundreds were without power after a Grand Island man drove off the road at 9:43 a.m. today and struck two power poles, including one with major transformer, at 3511 Ridge Road/Route 104, just past Church Road. Robert “Rob” Domagala, 23, was charged with speed not reasonable and prudent and failure to keep right. No injuries were reported and no other vehicle was involved. Power was out in an area stretching for several miles along Ridge Road, including a light that was out at Ridge Road and Route 425. Domagala was eastbound when he went off the north side of the road, according to Niagara County Sheriff Capt. Bruce Elliott. Elliott said Domagala, who was driving a 2007 Chevy work van owned by his employer, Standard Auto Wreckers of Niagara Falls, was not texting or driving under the influence, but he appeared to have been going “way too fast” for the rainy conditions. Domagala told deputies that the wet road caused his vehicle to hydroplane.